Hawkrigg House Self-cateringHawkrigg House is a beautiful, Victorian detached cottage which was formally a farmhouse. Right in the heart of Satterthwaite, a sleepy village close to Grizedale Forrest and Hawkshead. The main focus of holidaying in such a location is to enjoy peace and quiet and wonderful walking opportunities, whether it be round Esthwaite Water or along the designated routes through Grizedale, bicycle hire also available in the forest. Hawkshead, Coniston and Ambleside are not far away by car, bus or bike for shopping, eating and attractions although The Eagle Pub in Satterthwaite becomes the main meeting point for locals and tourists alike at the end of the day. (opening times vary throughout the year). Flagged floors, open fires and chere at Hawkrigg House whilst the three good bedrooms, two bathrooms and two lounge's ensure sufficient flexibility for you and your party of 7. Furnishings throughout are comfortable and of a traditional style, in keeping with the age of the property. 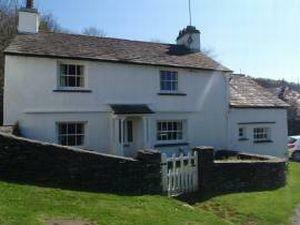 Hawkrigg House is a beautiful, Victorian detached cottage which was formally a farmhouse. Right in the heart of Satterthwaite, a sleepy village close to Grizedale Forrest and Hawkshead.